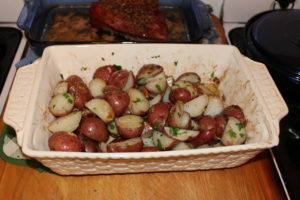 Last week, I mentioned I made roasted red potatoes for St. Patrick’s Day dinner. It’s an easy recipe that I am sure you and your family will enjoy. Preheat oven to 375 degrees F. Place butter in a 2-quart baking dish and melt butter in oven. Toss potatoes and union in melted butter to coat. Coat well so the potatoes will brown while roasting. Bake in oven until potatoes are tender, about 40 minutes. Sprinkle with parsley, salt and pepper and toss. Serve warm. I baked mine in a 350 degree F. oven during the last hour the corned beef was roasting. For this temperature, roast for an hour and your potatoes should be tender. Roasted red potatoes for St. Patrick’s Day, prepared in a Belleek basket weave 2-quart casserole baking dish made in Ireland.